The fact that Floyd Mayweather is still allowed to compete in professional boxing and earn huge sums of money despite the numerous domestic violence convictions against him has many people justifiably upset. However, there is at least one part of the saga that isn't awful: last Saturday's Floyd Mayweather fight seemingly spurred lots of donations to anti-domestic violence groups. Which doesn't make the rest of it better, but is still a good thing. According to the National Coalition Against Domestic Violence, they saw a surge in donations during the weekend of Mayweather's fight against Manny Pacquiao. During the three previous weekends, they averaged about $300 in donations; last weekend, the preliminary total is about $4,000. It's certainly not comparable to the $180 million that Mayweather is estimated to have earned from the fight, but it's definitely money they could use. The National Domestic Violence Hotline says they also experienced an uptick in donations, taking in 80 percent more money in donations in the week leading up to the fight than they did the previous week. They also say the number of calls were up as well. “What will happen is that someone may not even realize that they are experiencing violence in a relationship, but then they see thing play out in the media and hear these conversations and reach out because they realize something isn’t right,” Cameka Crawford, chief communications officer for the hotline, told Vocativ. She added that the number of calls they receive also went up following the stories about NFL player Ray Rice attacking his then-fiancé last year. People have also reportedly been donating to local domestic violence programs after being prompted by ESPN's Sarah Spain to take the money they would spend on the fight and put it towards a better cause. It's great that anti-domestic violence organizations are getting some much needed funding out of all this, but that doesn't really make up for the harm done by allowing Floyd Mayweather to continue to rake in the millions from a professional boxing career. 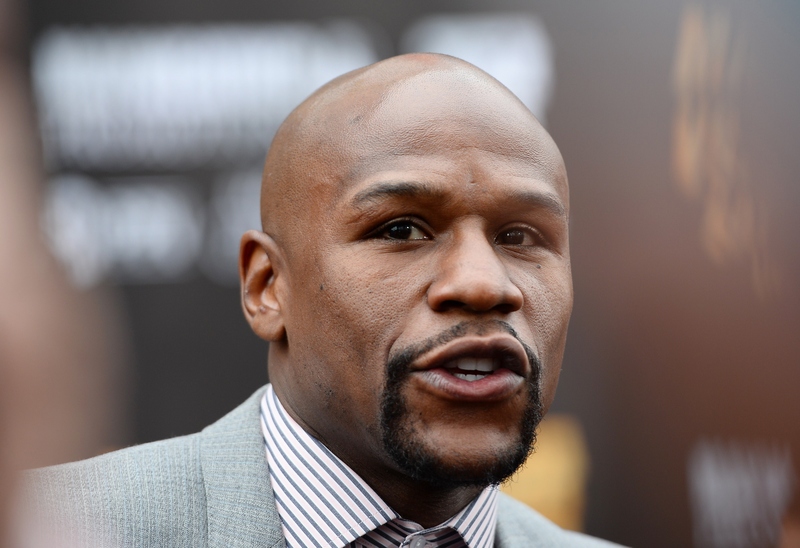 Mayweather has a long history of allegations of domestic violence, with seven alleged assaults reported against five different women. He has been convicted three times, once in 2001, again in 2003 (though this conviction was later vacated after the victim changed her story), and most recently in 2010. Yet despite all of this, he has never been suspended from professional boxing, mostly because boxing leagues don't have any policies against domestic violence. Letting Mayweather continue to participate in the sport and enjoy the fame and the money that comes with it despite three domestic violence convictions is not only unjust, but also sends a terrible message that abusing women is unimportant. It's like saying, "Sure, we know that you're abusive, but it doesn't matter as long as you're still good at your job." Except instead of just saying it to Mayweather, professional boxing has basically said it to the world. Domestic violence is a serious issue, but it thrives because we as a society don't take it seriously. We send young men the message that being abusive is not actually that big of a deal, and we send young women the message that a woman's trauma is of secondary importance to a man's career. And it's frustration with that message that potentially prompted a lot of people to give to a worthier cause instead. As Ruth Glenn, the executive director of the National Coalition Against Domestic Violence explained to Voctiv, donors are often motivated to give when they see clear examples of the wider culture not holding abusers accountable. Hopefully, the National Coalition Against Domestic Violence and Other organizations will continue to get additional support due to the awareness raised by the controversy around the Mayweather fight. And if nothing else, they did at least see some additional funding, which I'm sure they will make great use of. It's better than nothing.